Nurses and other medical workers await a bargaining date for long-awaited contracts with the Deaconess Hospital, Spokane, Wa. 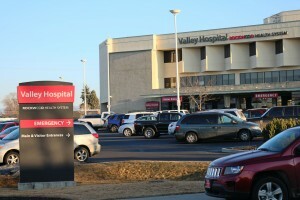 and Valley Hospital, Spokane Valley, Wa. Their key demand for more staffing to improve patient health and safety goes unanswered by the hospitals’ for-profit owner Community Health Systems Inc.
At dispute is whether patients are at risk because management at Spokane Deaconess and Valley hospitals are not hiring enough nurses, cleaning, and other medical staff to protect patients from falls, infections, and other problems that prevent a speedy, successful recovery. The union said the Tennessee-based company is cutting back on staff at its Spokane hospitals for the sake of larger profits. The SEIU local said administration has not responded to requests for statistical information that would back up workers’ case for more staffing at the Deaconess Medical Center, Spokane, Wa., and Valley Hospital in Spokane Valley, Wa. “Patient falls, failure to rescue, infection all increase as patient-to-nurse ratios increase,” said Teri Nicholson, an outpatient nurse at Valley Hospital who is on the bargaining team. Some sort of agreement is needed. I cannot imagine that the management and medical staff at Valley Hospital and Spokane Deaconess Hospital would disagree with that. According to SEIU, Spokane Valley Hospital employees have worked without a contract since December 2012. Spokane Deaconess Hospital service employees’ contract expired last May and its technical employees’ contract expired in August. In November, after the union filed an unfair labor practices complaint against Community Health Systems Inc.-Rockwood Health Systems for not coming to the bargaining table, a mediator was called in, Nicholson said. In December, Spokane Valley Hospital locked out about 80 nurses for 72 hours and brought in replacement workers after the nurses and other employees held a one-day strike at Valley and Deaconess Hospitals.